WANACU goes facebook! 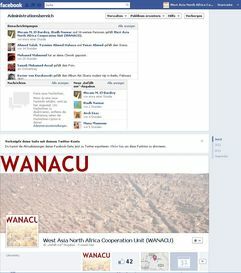 On 20th March 2012, WANACU's new facebook site, to be found under the link www.facebook.com/WestAsiaNorth AfricaCooperationUnitWanacu, went online. We will regularly post news and photos on the site. Please "like" the site and you will be able to follow us and post any comments and questions. We hope to meet you on facebook soon!